After World War II, many veterans suffered post-traumatic stress and other mental illnesses. Now, long-buried documents have come to light that reveal how nearly 2,000 of these soldiers who were given lobotomies in VA hospitals. They were sent home to their families with this "care" pamphlet. 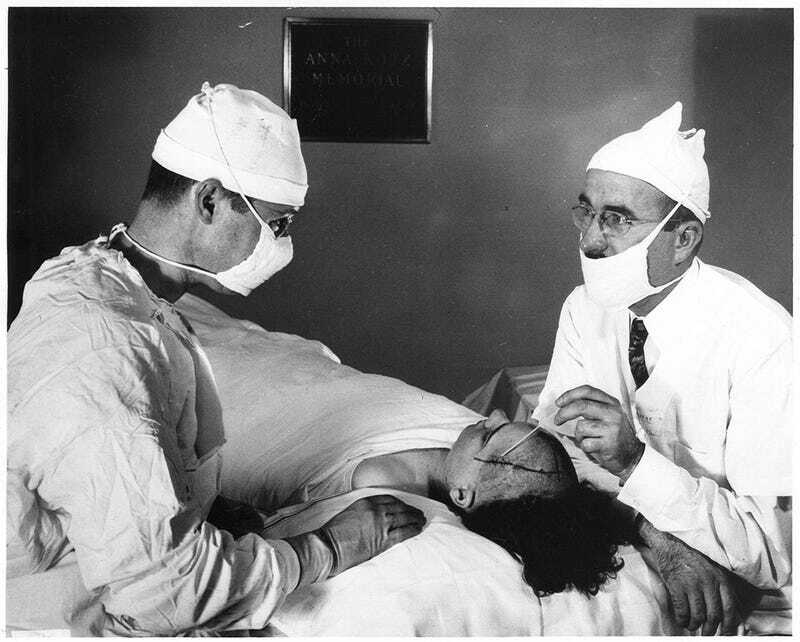 Photo of doctors examining a lobotomy patient via The George Washington University. Today the Wall Street Journal published a powerful investigative article by Michael Phillips about those lost veterans. After uncovering evidence in a veterans archive of the now-discredited lobotomy treatment, Phillips was able to find one man, Roman Tritz who had survived it and lived a relatively independent life — though he continues to suffer the same paranoid delusions that made doctors perform the lobotomy in the first place. His story is tragic, and reminds us that one generation's cutting-edge psychiatric treatment is the next generation's horror story. Phillips found that many doctors at the time questioned the treatment — including the one who performed surgery on Tritz — but that they believed there was no alternative for violent and deeply disturbed patients. Many patients died from the operation (one VA hospital had a 15% fatality rate), and others could never care for themselves again and were permanently institutionalized. Still, some were able to resume mostly normal lives — and others, like Tritz, returned home but were never themselves again. Despite the setbacks, VA hospitals in the 1940s and 50s tried to put a happy face on the procedure, promising that veterans could return home. But when these patients did go back home, the hospitals sent this pamphlet to their families. It reveals clearly that the VA hospitals knew these lobotomized patients might never behave "normally," though they believed the post-lobotomy behavior was better than it was before the operation. Read more of the article, and see more documents, at the Wall Street Journal.